Urine Therapy - What the Hell??? Urine Therapy has Been Used for Centuries! Natural health and well being are my passion, that's why I need to report on anything I come across that may be helpful and innovative to your health. Keep that in mind as you read my latest post here on consuming your own urine as a health benefit. Here we go! For the record, I am a guinea pig for most cutting-edge therapies, but I have not personally tried this nor am I condoning it. I am simply reporting some of the astounding accounts by many people who have and creating a space for questioning some of our long-time beliefs that may not be true about urine. Throughout the 20th century, unknown by many of us, doctors and medical researchers have been proving both in laboratories and clinical testing that our own urine is of great value and is a source of vitamins, hormones, enzymes and critical antibodies that cannot be duplicated or derived from any other source. Our urine is unique to us and no two are the same. Urine is being used to heal cancer, heart disease, allergies, auto-immune diseases, diabetes, asthma, infertility, infections, wounds and on and on. We have been taught the urine is a toxic waste product which just isn't true. The discrepancy between the medical truth and the public information regarding urine is ludicrous. Many studies claim that it could mean the difference between life and death to you and your loved ones. I like most people have been trained from the earliest years of my life to regard urine as a waste product. Any thoughts on using it as a healing power seem disgusting and shocking. Yet urine has played a role in holistic medical traditions all over the world. It is even mentioned in the Ebers Medical Papyri of ancient Egypt. Urine is free, sterile, and acts homeopathically to repair the immune system. The fact is urine may be the best tonic available for your immune system. Urine therapy already plays an important role in medical systems of countries as diverse and Germany, Japan, and India, this health treatment is now becoming popular in the United States as well. In India, urine therapy is called "shivambu". The Prime Minister of India, respected Morarji Desai boldly stated to the world he regularly drank his own urine and attributed his good health and longevity to it. Many are indebted to him for his honest frank declaration as an act humanitarian service. Urine is not a dirty toxic substance that is rejected by our body as we have been taught. Urine is a by-product of blood filtration, not waste filtration. Medically urine is referred to as "plasma ultra-filtrate". It is a purified derivative of the blood itself, made by our kidneys, whose function is not excretion but regulation of all elements and their concentrations in the blood. We can look at urine as a leftover from a meal, we can't always finish so we get rid of what is leftover. Let's understand what happens in the body as nutrient blood passes through the liver where toxins are removed to be excreted as solid waste. Then eventually, this purified "clean" blood undergoes a filtering process now in the kidneys, where excess water, salts, vitamins, minerals, enzymes, antibodies, urea, uric acid and other elements not usable at that time by the body are collected in the form of purified, sterile, watery solution that is now called urine. The whole job of our kidneys is to keep various elements in the blood balanced. Important elements in the blood are not filtered out because they are toxic, but simply because the body does not need a particular element at that specific point in time. Basically, our kidneys are regulating us when we eat or drink too much or more than our bodies need at one time. Why is Urine Thought to be Invaluable? Urine is considered an invaluable source of nourishment and healing. It is thought that because it is not financially rewarding and controversial that it is not talked about. Your urine contains elements that are specific to your body alone. Your body is constantly producing a variety of antibodies, hormones, enzymes and other natural chemicals to regulate and control imbalances that you may not even be aware of. Many clinical studies have proven that chemicals and nutrients that end up in your urine reflect individual body functions. When reused, these chemicals and nutrients act as a natural vaccine, antibacterial, antiviral and anticarcinogenic agents as well as balance our hormones and relieve our allergies. Just as there are no two people who are exactly the same there are no two urine samples that are the same in the world. Do not take this therapy lightly. Multiple sclerosis, colitis, lupus, rheumatoid arthritis, cancer, hepatitis, hyperactivity, pancreatic insufficiency, psoriasis, eczema, diabetes, herpes, mononucleosis, adrenal failure, allergies and so many other ailments have been all relieved by the use of this therapy. Are you overcome by a gag response? I know I am having one and I haven't even thought of trying this. From all the research I have done, this will soon be gotten over with when you realize that something very big is going on and you are realizing better health because of it. This is an area worth investigation. There are so many studies going back to the turn of the century supporting the efficacy of using urine for health. Sometimes when all else fails one will turn to alternative health options. There are many good books written about urine therapy and every one of us has the right to know that our bodies produce an invaluable source of nourishment and healing that we can utilize to heal ourselves. Urine therapy has been practiced for thousands of years and has fallen into obscurity the last century. Although it probably seems unorthodox, it isn't anything new. In Greece, it is reported the urea found in urine has anti-cancerous properties. It seems urea has the ability to disrupt cancer cells that group together and kills them by upsetting some of their normal metabolic activities. Urine therapy has been used to treat cancers of the skin, cervix, lungs, eyes, breast, and liver. The first question that probably comes to mind is whether urine is a toxic substance or not, and how can a toxic waste product ever be a benefit to your health. It is scientifically proven that urine is "NOT" a toxic waste product. Urine is made up of 95% water, 2.5% urea and the remaining mixture of minerals, salt, hormones and enzymes that are unique to your body. Toxic substances in the body are removed the following ways, through the liver and intestines, through the skin, and through our out breath. The hardest thing for you to stomach will be knowing the truth about this incredible natural substance will be the most beneficial health fact you will ever learn. This natural healing modality has been being used for decades, and yet none of us have ever been told about it. Why may that be? Partly we are misinformed about what urine is and partly there is no monetary reward for telling people what scientists already know about the most natural healing element in the world. There are many good books out there about Urine Therapy. Martha Christy and Marin Lara to name a few. First, collect midstream urine in a clean container. This must be a clean catch, meaning the genital area has been well cleaned beforehand. To 1/6 ounce of distilled water in a sterile bottle, add one drop of your own fresh urine. Cap and shake 50 times. Take one drop of the mix and add another 1/6 ounce of 80-90 proof vodka which acts as a preservative. Place three drops under the tongue hourly until there is obvious improvement or exacerbation of symptoms. As you improve, lengthen the interval between treatments. After 3 days, suspend treatment to avoid pushing your immune system too hard. Repeat this process if progress remains the same or relapse occurs. Always use fresh morning urine, do not dilute the urine and use it in its natural form. Start by taking 1-5 drops of morning urine on the first day. On the second day, take 5-10 drops in the morning and on the third day take 5-10 drops in the morning and evening as well. Once you feel accustomed to the therapy, gradually increase the amount needed for obtaining results for your condition and observe your reactions to the therapy. Does Urine Have Supernatural Qualities? Bob Silverstein, N.U.T. (Naturopathic Urine Therapist) states that this well documented, proven therapy, has an amazing power to heal a variety of ills, with no negative harmful effects. Urine comes from our blood, it contains, "life force", with super natural qualities. Urine therapy is being used to treat Aids, (only Aids antibodies in urine), cancer, fatigue, anemia, all sorts of other diseases, colds, and flu, Candida, diabetes, digestive problems, jaundice, etc. It is medically proven against polio, rabies, and tuberculosis. There are roughly 175 diseases treated with urine therapy. Urine is ingested or rubbed into the skin, it purifies blood and tissues, provides useful nutrients and signals the body about what is out of balance. The book called "The Golden Fountain", is the complete book to date on urine therapy, it is the result of those investigations. Urine as medicine in one form or another can be found in medical traditions of people or tribes who are in contact with nature. Native North Americans, gypsies and Eskimos are all among those cited in this book. 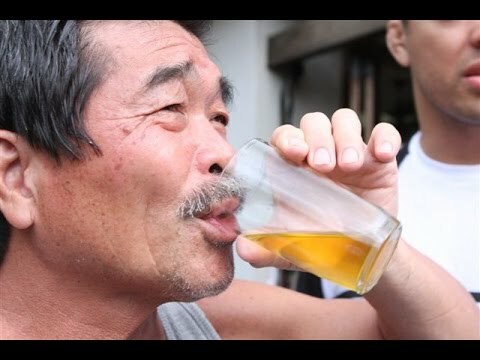 A study was done in Beijing, June 1, 2000, revealed that three million Chinese drink their own urine in the belief it is good for their health. A seminar in Shenyang was told that urine contains active ingredients that will strengthen their immune system. Urine contains no bacterium and is more sanitary that blood. Martha Christy, who suffered a long list of chronic ailments of untreatable illnesses by conventional medicine reluctantly agreed to try urine therapy and experienced almost immediate relief. She went on to document this story and those of many others in her book. She cites numerous medical studies in her book you can reference that have been conducted on urine therapy. I think there are many beliefs that I have that are untrue and biased. None of us can survive them, either from our parents or the media we are constantly under fire. Doing research and forming our own opinions of things is the best that we can do. I found this whole topic very enlightening and shocking. I can't say I will run out and drink my urine tomorrow, but if I became very ill and had no results from other modalities, maybe I'd try it now that I have learned that it isn't a nasty waste product like I was taught. I have read many books where people have lived through survival situations by drinking their own urine. I remember wondering why they didn't get horribly sick. Turns out drinking your own urine won't make you sick, it may actually make you well. Something to think about!